Disclaimer: Please, please talk to your health care professional before attempting any kind of exercise during pregnancy. I am only a mama that likes to exercise and am sharing from my own experience of exercising during my own pregnancies and what my midwives and doctors have informed me of. One of the hardest things for me about being pregnant has been not being able to exercise like I usually do and gaining weight. I know it's silly but these are the things I have struggled with. Exercising has not only been a way for me to stay in shape but has been so good for my state of mind. Now on my 6th pregnancy I am coming to terms with my changing body and learning how to still exercise while embracing my growing body. I have always been driven to excel in running and working out and have found my groove now in letting go of my competitive side during pregnancy yet still making time for myself to exercise in moderation. 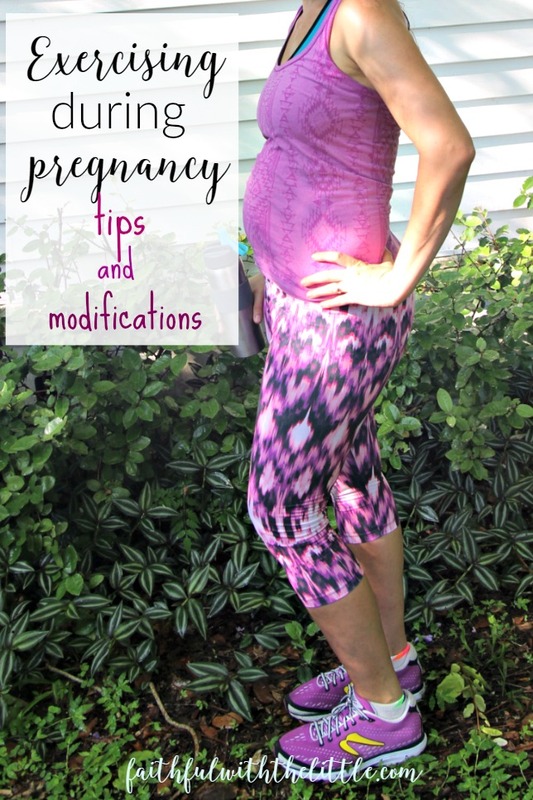 Can you exercise/lift weights/ run during pregnancy?? When you find out you are pregnant your Doctor or midwife will usually tell you that you can safely exercise if you have already been maintaining a workout routine. If you haven't been doing any kind of exercise before pregnancy it's probably best not to start lifting weights and going running now. ;P Your heart and your body will not be used to it. Walking, swimming or light workouts would probably be the best thing. Because I have had a routine of working out regularly up until pregnancy my midwives have always given me the clear to keep up with my workouts and running. In terms of lifting weights, 20 lbs is always the maximum for pregnancy. I have 2 10 lb. weights that I have been using and have continued to use but never go above that. There are some crazy body builder women who lift more then that but I am sure they had to get approval from their doctors. There are of course times when I lift my little ones who are over 20lbs but I am not doing it consecutively or at a fast pace. But I try to only do it when necessary. A good rule of thumbs is to not let yourself get too out of breath while working out. Yes, you will be breathing a harder but when you stop you should still be able to talk. The same goes while running. You should be able to talk without deeply huffing and puffing. If you are, then you are going to fast or pushing yourself too hard. I never ever sprint during pregnancy, that is a big no no. If you feel like you are going to pass out after a run or workout you have probably pushed yourself too hard. I have done that a couple times and always freak myself out so I really try not to overdo it. I have slowed down a considerable amount since before pregnancy. My pace before pregnancy was about 8 1/2 -9 minutes per mile and is now about 10 1/2 -11 now that I am in my 2nd trimester. I can't physically go any faster so I am fine with my slower pace. I love still being able to get out and move! Once I get to my third trimester I probably won't run at all and slow down to a walk. It's already so hard for me to remember to drink water so I have to be especially diligent to stay on top of my water intake. I have been keeping tally of how many glasses I drink a day to make sure that I have been getting my daily quota. Make sure to drink water before, during and after working out. I sometimes workout before eating but I usually eat a protein filled meal or snack right after or space my workout in between meals. I love drinking these protein filled chocolate shakes right after a workout. I do many of the same exercises I do pre pregnancy but many I have to modify. I don't really do any ab work. I modify any kind of exercise that calls for jumping. For instance jumping lunges I will just do lunges for and burpees I just stand up instead of jump up. I don't go to my normal early bootcamp regularly as sleep is a priority for me right now so I have been doing most of my workouts from home when I am able during the day. I love fitness blender! They have so many great diverse workouts with warm ups and cool downs and always include modifications. I try to work out at least 3-4x a week. ( notice the emphasis on try) Sometimes it happens sometimes it doesn't. The main thing is to find out what works best for you. If you feel good working out every day and have the time go for it, if not do what you can. It's always a good idea to warm up and stretch before any workout and even more so during pregnancy. Your body is stretching and doing all kinds of crazy things so it's best to warm up and stretch your muscles before going into a work out. It's also really good to cool down afterwards and slowly get your heart rate back to normal. I believe that still making time for myself during pregnancy has been key in keeping me sane and helping me to feel prepared for childbirth. There is no reason that just because you are pregnant you have to lose all your muscle and be a couch potato. Yes, I get tired a lot more easier these days but I always sleep better if I have worked out that day and feel more motivated to get things done after a good workout. I don't always feel like working out normally let alone when I am pregnant but if I make myself do it I am always glad I did and feel better afterwards. I feel strong for the task ahead of me as well as the task in front of me of taking care of my family. Remember to enjoy this new season of your life. Yes, our bodies are changing but it's for the best possible reason. It's so amazing and beautiful! Always err on the side of being cautious instead of pushing yourself too hard. Though it might seem like you are pregnant forever, you will have a permanent waddle and that you have gained 100 pounds, it won't last forever and those pounds will eventually come off. Give yourself a lot of grace during this time and do what you feel is best for your body and baby. Don't compare your growing body to other pregnant mamas. Believe me it's inevitable that you will find someone that you think looks way better than you. We all carry our babies differently and were not meant to look all the same. Embrace this beautiful time and if you are able enjoy the benefits of staying fit and exercising during pregnancy! Do you exercise during pregnancy? What do you like to do to stay active during pregnancy? Do you find it hard to get motivated to exercise during pregnancy? I find it hard to get motivated to work out regardless of whether I'm pregnant or not. ha ha I did a prenatal workout and yoga in my 3rd trimester with my second daughter, though, along with yard work earlier on, and I think it helped out a lot as far as the actual birth went.